* Stata has a wonderfully effective simulate function that allows users to easily simulate data and analysis in a very rapid fashion. * The only drawback is that when you run it, it will replace the data in memory with the simulated data automatically. * Which is not a big problem if you stick a preserve in front of your simulate command. * However, you may want to run sequential simulates and keep the data form all of the simulations together rather than only temporarily accessed. * Fortunately we can accomplished this task by writing a small program. * Gettoken will split the arguments fed into msim into those before colon and those after. * I really like this feature of Stata! * First let's strip the colon. The 1 is important since we want to make sure to only remove the first colon. * Now what I propose is that the argument in `before' is used as an extension for names of variables created by the simulate command. * First let's save the current data set. * Now we run the simulation which wipes out the current data. * Get rid of the _merge variable generated from the above command. 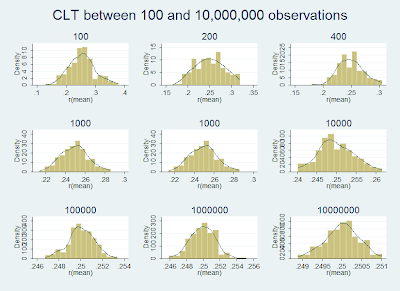 * Let's say we would like to see how many observations we need for the central limit theorem (CLT) to make the means of a bernoulli distribution look normal. Remember, so long as the mean and variance is defined the generally central limit theorem will eventually force any random distribution of means to approximate a normal distribution as the number of observations gets large. * Now normally what we need to do would be to run simulate again with a different argument. * But instead let's try our new command with 200! * The next two commands can take a little while. 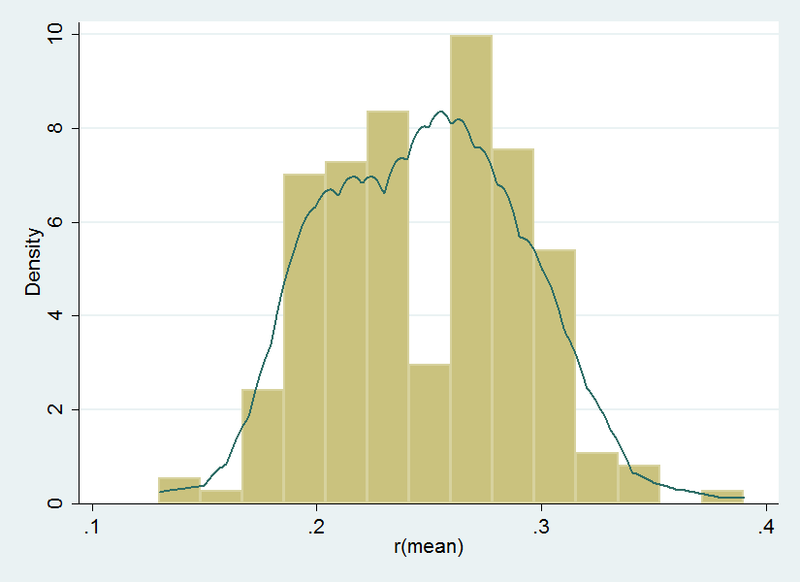 * We can see that the standard deviations are getting smaller with a larger sample size. * How is the histograms looking? * We can see that the distribution of means approximates the normal distribution as the number of draws in each sample gets large. 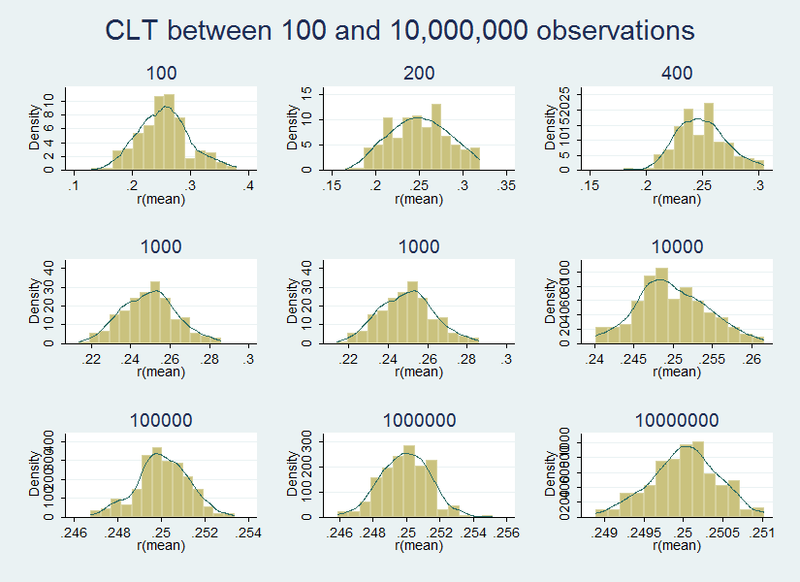 * This is one of the fundamental findings of statistics and pretty awesome if you think about it.